Could Christie’s handling of Superstorm Sandy hurt his presidential bid? More than anything else, Sandy was the one, single event that catapulted Gov. 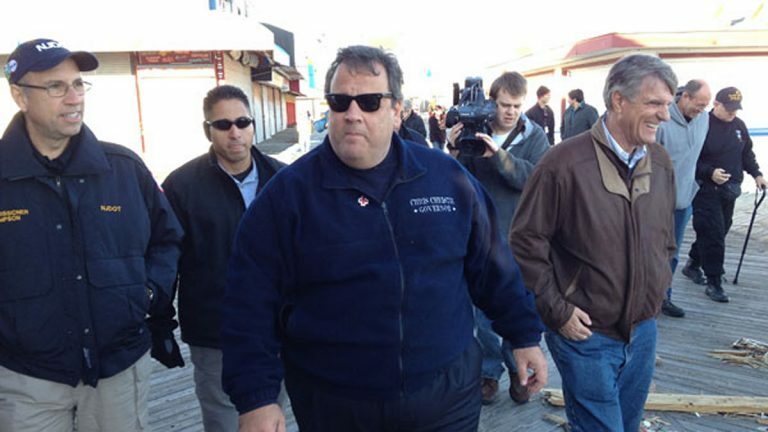 Chris Christie to national prominence. He was ever-present in his blue fleece jacket, comforting storm victims, making the rounds on the Sunday talk shows, and touring damaged boardwalks. In the months that followed, Christie’s popularity in New Jersey shot to 70 percent, an all-time high. But two-and-a-half years later, that support has largely eroded, due to problems with the recovery and a variety of other, unrelated issues confronting his administration. Now, frustrations with his handling of the storm threaten to turn into a liability as he campaigns for president. It’s not just storm victims and Democrats trying to score political points that have been critical of the governor. He’s also lost support among some top Republicans in the state, who cite the problems with the Sandy recovery as an indication that his management style would be unlikely to achieve positive results with other issues on the national level. To political observers, the fact that a politician like Christie would see a temporary bump in the polls in the immediate aftermath of a natural disaster was entirely predictable. What’s surprising, however, is how far he’s fallen since then. As has been well-documented, it’s been a slow and rocky recovery, beset by a number of missteps: The state lost storm victims’ paperwork. It wrongly rejected many people from getting aid. And there were widespread problems with the private firms hired to distribute aid, as Christie acknowledged last month on his “Ask the Governor” radio show, responding to a question about what he would have done differently. “There is pressure to rush significantly in selecting the people to help you run these programs, and you want to start going as quickly as possible,” he said. 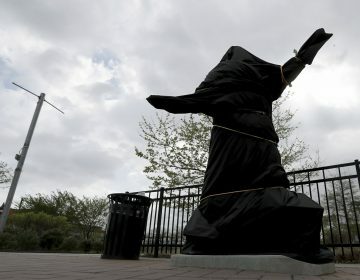 “And you need to take a deep breath and take a little more time in that process.” Today, thousands of people are still out of their homes, and Christie’s popularity in New Jersey has dropped to record lows, fueled also by the ongoing investigation of Bridgegate and the state’s eight credit downgrades under his watch. While slightly more than half of residents statewide still say they’re satisfied with his handling of the Sandy recovery, two-thirds of storm victims tell pollsters they feel he’s turned his back on them, and they’re vocal about their discontent, as evidenced by recent protests in Belmar and Iowa. A sign of the extent of Christie’s Sandy problem can be found in the affluent Jersey Shore community of Bay Head, where one of the state’s leading Republicans is openly criticizing the governor. “New Jersey’s done a terrible job. The people they hired were the wrong people. The people the administration put in place to manage the process don’t have any authority,” said Larry Bathgate, who was Republican National Finance Chair under President Ronald Reagan and the President George H.W. Bush. When Bathgate calls around to his friends, he’s capable of raising a lot of money, so people took notice when he organized a fundraiser a few months ago for his presidential candidate of choice: former Florida Gov. Jeb Bush. Of the three dozen fellow Republicans he invited to the dinner, only one person declined to attend, saying she was a Christie supporter. Bathgate said he’s seen kinks in the state’s handling of the Sandy recovery up close, as both a beachfront homeowner and an attorney representing dozens of towns fighting for funding. Like many residents of Bay Head, he’s strongly opposed the Christie administration’s request that residents grant an easement in perpetuity to allow the state to build a line of protective dunes along their coastline, especially considering that homeowners in town have already chipped in their own money over the years to build and maintain a protective rock revetment. The expense would be wasteful and against Republican principles, he said, noting that the money would be better spent providing fortifications against flooding on the bay side of the island. 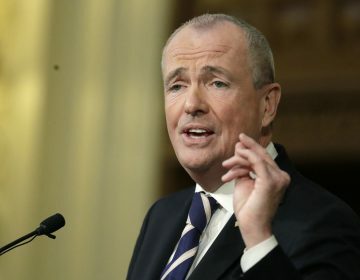 Further, he thinks a large part of the reason New Jersey has received $10 billion less in Sandy FEMA public assistance than New York is because Christie’s people failed to do their due diligence and hired a less-experienced firm to help them apply for the money. Christie allies have responded that Bathgate is simply disgruntled about the proposed dunes blocking his view of the ocean. 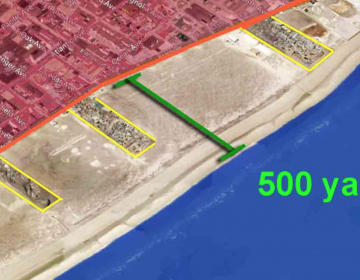 It’s a charge he says is factually incorrect, since his view is already blocked by the existing sea wall. It’s also worth noting that he has a long-standing relationship with the Bush family, but he says his support of Jeb instead of Christie or any of the other prospective candidates was never a given; he believes Jeb is the strongest candidate in the field. Bathgate claims Sandy is just one of many reasons he’s not backing Christie, but he says Christie’s failure to have a better record of results in handling the storm’s aftermath raises important questions about his suitability for national office. He added that he doesn’t personally dislike or harbor any animus toward the governor, but when it comes down to it, Republicans are looking for two things in a presidential candidate: competency and electability. Compared with Jeb Bush, Chris Christie falls far short on both of those metrics, Bathgate said. Bathgate isn’t the only prominent New Jersey Republican to leave the Christie camp. State Senator Joe Kyrillos (R-Monmouth) — who chaired Christie’s 2009 gubernatorial campaign — and New York Jets owner Woody Johnson, who once backed Christie, have also attended recent fundraisers for Jeb Bush. Still, Christie remains popular among a minority of influential party faithful like billionaire Home Depot co-founder Kenneth Langone, who’s said he will do “everything possible” to help get Christie his party’s nomination once he officially announces his candidacy for president. In defending their record on the Sandy recovery, Christie administration officials have said they’ve made a number of changes and reforms to speed up the flow of aid money and correct past mistakes. Speaking in a recent radio interview, the governor said he’s done the best he could, given the challenging circumstances. Nevertheless, critics worry that his frequent travels out of state mean he’s not devoting enough attention to the storm recovery. Christie says he can handle both at the same time, but even if he can, he’s in a bind. The more time he spends on the road, the less time he appears to be working on governing his home state, and the resulting low favorability ratings in New Jersey could end up hurting him on the national stage.